This floating acrylic plaque is an outstanding way to recognize personal achievement. A mirror image of the design is precision laser engraved on the reverse of the acrylic face for a three dimensional appearance, preserving a glossy surface finish. The base is available in a high gloss rosewood or piano black finish. A complimentary round of design proofing and laser engraving are included in the purchase price. 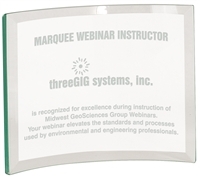 This perpetual plaque program is a great way to recognize an outstanding employee each month of the year. The program price includes a walnut finish perpetual plaque, 12 plaque plates for each month, as well as 12 gold employee name badges recognizing the recipient as the Employee of the Month. A pin backing for each name tag and shipping and handling via USPS First Class Mail for the monthly name plate and badge installments are included. Following your program order, the monthly winner's name and title may be submitted along with your order number to info@providenceengraving.com.